All those fermenting vessels under the looming Merlot barrel contain Russian Imperial Stout. Yesterday the TAbc drained the beer into that barrel to condition over the summer. The first task of the day was to sanitize the barrel with 20 gallons of boiling water. The barrel sits high on its rack making gravity transfer tricky. The duck-in cooler gave us the necessary height. 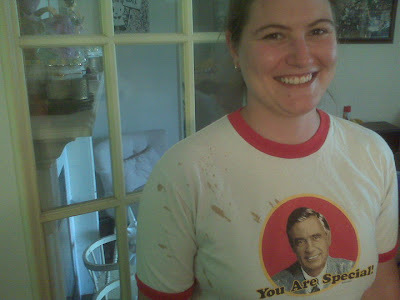 Surprisingly little beer spilled, but what did come out flew across the room, landing on Ruth. After a long day of barreling, the beer came to rest in my cold room, where it will sit until we bottle it in October. I bottled a 12-pack pre-barrel for comparison. Thanks to everyone for coming out to see me talk at Christopher’s tonight. For an Italian, he makes some delicious German food. If you want to know more about making beer at home, read this post and come out for Teach A Friend to Homebrew Day on November 7th. The Texas Aggieland Brew Club will be making beer in front of the Village Cafe/Art 979 Gallery in downtown Bryan starting at 11am. If you can’t make that we hold regular meetings on the third Friday of the month. We are organized through Facebook only right now, but if you get in touch with me I will make sure you know what is going on. I hope you enjoyed the dinner as much as I did. I can do the same for your restaurant. I also train staff and give general beer menu advice. Drop me an email. Thanks for finding me (see the interview video if you are a regular reader). Homebrewing is a rewarding, useful hobby. It can be easy or intricate, scientific or artful. For the impatient, join the Texas Aggieland Brew Club on Facebok and read about the process on HowToBrew. Or get in touch with me personally. The beer you saw me making was a three gallon batch of nettle beer. It is a recipe I want to start experimenting with. The beer I drank throughout the interview was a Belgian Tripel. 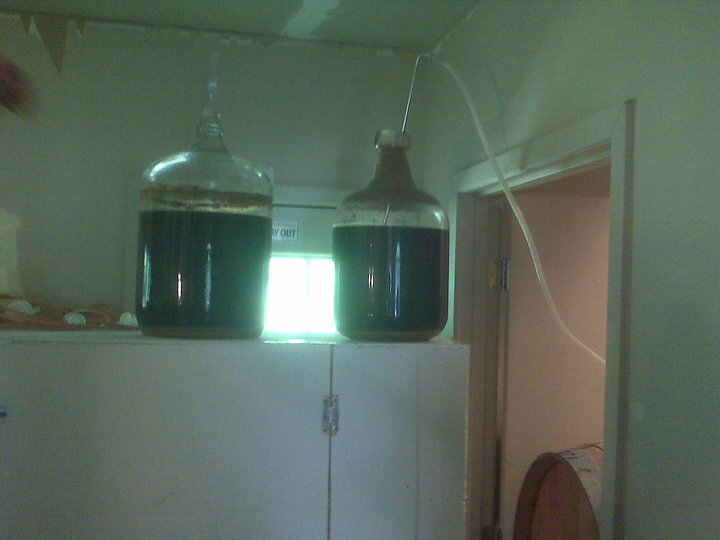 Typically, homebrewers make five gallons of beer at a time so most of the equipment is sized appropriately. To get started making your own beer you need a few specialized tools and some basic kitchen gadgets. Homebrew specialty stores sell equipment kits that will get you started. Check out Austin Homebrew Supply – they have a good web store and it only takes a day for UPS to get to B/CS. You will also need a large kettle, six to seven gallons is ideal, however I started off with a twelve quart pot. When you purchase equipment, also pick out some recipe ingredients. Austin homebrew has around 120 pre-assembled recipes that come out to around $0.55 a bottle. A great way to learn the hobby is to get together with some other homebrewers and make beer. The TAbc meets monthly on the third Friday evening of the month. We have a number of experienced brewers and beer lovers to answer questions. My friend Martin Codrington asked me to speak about homebrewing on his radio show tonight. Listen in to 89.1 at 6 o’clock. Sadly, I can not find a stream online link for KEOS, so if you are not local you will have to wait for the tape. I will point listeners at this blog as the jumping-off point for everything I talk about. If you are new to homebrewing I suggest digging into John Palmer’s free book How To Brew. It is an in-depth book covering the three broad ways you can make beer. Intermediate brewers should read Designing Great Beers by Ray Daniels and Principles of Brewing Science by George Fix. Being a desciple of experience, I recommend instead finding a homebrewing friend and make some beer. If you don’t know any homebrewers in Bryan or College Station plan to attend one of our homebrew club meetings. The next meeting is scheduled for the evening of April 17th. We do not have a web site yet, but you can find us on facebook or drop me an email and I will add you to my mailing list. I am @brundage on Twitter. Contact me somehow for club details. Austin Homebrew A good place to buy supplies. Today is International Teach a Friend to Homebrew Day so I had a few friends over and made beer. Some of them knew how to brew, some of them did not, and one of the latter is gonna give it a try. I ended up making about 15 gallons of beer in two batches. Allow me to elaborate. I bought ingredients for 10 gallons of AHS Evil Brown ale and everything was set to go at 10 o’clock this morning. There was one flaw in my plan, you see at the last club meeting we discussed Bryan/College Station water quality. It turns out that our water is simply awful for brewing – there’s too much sodium and hardness. With this in mind I went down to Jacob’s Well and got 20 gallons of reverse osmosis filtered water. I know better than to brew with only RO water, and thought I had some Burton salts in my box of homebrew supplies. I did not. Nor did I use any tap water in my mash like I should have. My efficiency suffered severely because of this and I extracted 10 gallons of 1.022 wort where I should have seen 1.050-ish. The remaining grains were still sweet so some of the other homebrews convinced me to do another batch. This time I added about a gallon of tap water to 5 gallons of RO. The mash went through starch conversion in about 15 minutes and I mashed for a total of 40. The resulting wort came out around 1.031 SG. I tossed some left-over Magnum and Goldings hops in the boil and split my yeast starter between the two fermenters. They are in the duck-in cooler right now. So it took me two mashes and 15 gallons to get all the sugar out of my grains, but I like low-alcohol session beers. I’m curious to tast the brews. I had those nagging cooling problems. Next time I will run my pump at a slower speed. It was a great day. I even found the time to grill two racks of spare ribs and Adrienne made mozzarella. Other folks brought home and commercial brew meaning everyone was well fed and well drunk. Analytics shows me that people come to my blog looking for information on homebrew clubs in the Bryan / College Station area of Texas. Since I am trying to start one up I thought it good to increase my pagerank with a little post about the new club. My wife and I moved to Bryan in January 2008 from San Jose, CA. I was part of the Sudzers homebrew club there, and upon arriving in the Bryan/College Station area I checked around for clubs. Not finding any I decided to try starting one. Using Craigslist and the TexAgs forum I quickly amassed a number of homebrewers. 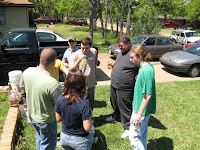 Our first meeting happened in April with about 20 people showing up to brew beer. The second followed a month later and the third will be this weekend. We do not have a name or web site yet, but I hope to decide upon that this weekend. If you want to learn about making beer, or like drinking good beer contact me. Follow this blog too, check the posts tagged brewing. Weeks in advance the word went out through Craigslist, Facebook and TexAgs, trickling through emails from friend to friends. When brewday about 20 people showed to share beer, make beer, talk beer and have a good time. Three people brought their gear and we made 21 gallons of beer. I made an ordinary bitter, Ian made some hefeweizen, and a trio of brewers crafted chocolate raspberry stout. I would say it was a great success. There was plenty of home and commercial brew going around and there was some great tri-tip off the bar-b-que. As is typical of many homebrew clubs, there was just a little bit of club business to discuss and a next meeting to decide on. Josh and Leslie volunteered their place for the next meeting and we quickly decided on May 3rd. I am pretty excited at the ease with which everyone got along and the eagerness of the group to continue gathering. Mash at 150° F with 1.7 quarts water per pound of grain for 90 minutes. Starter of WYeast 1098, British Ale yeast. My brew-day went smoothly until the end. My kettle screen let some hop leaves by and they got clogged somewhere leaving me with half-chilled wort. What I should have done was stop the chill, disassemble my apparatus and back-flush the system into the kettle. What I did instead was to dump the hot wort into the fermenter to air cool. I had to walk the fine line between pitching yeast into scalding wort and giving infection too much time to take hold. I think I pitched too hot because it took about 24 hours to see activity from a decent starter. I would really like to get my system hard-plumbed and on a stand. I had two new gadgets to play with yesterday. The filter worked well once I realized it would be fine if I glued the casing together instead of worrying about replacing the filter after 10,000 gallons. I also bought a “Squirrel” brand paint mixer to aerate wort. That thing whipped up a six-inch head of foam in no time, making it a great purchase. In January Adrienne and I moved from San Jose, CA to Bryan, TX. The Bay Area has a thriving homebrew culture and I was a member of the Silicon Valley Sudzers. Club meetings and outings are something that Adie and I both enjoyed and we left a great group of people behind. Sadly, the Bryan/College Station metro offers no clubs. Last month I started looking for interest in starting up a club. In my research I came across a Yahoo! group from a club that had been active in the early part of the century (last post 2005). I believe that there are enough brewers in the area to support a club so, with the help of Adrienne and two or three other brewers, I am founding a B/CS club. We do not have a name yet, but we do have a first event: a brew-in on April 5th. The first order of business is to publish the event in the various electronic media, and track interested people. Watch this blog for my experiences starting a club. I have some solid resources back with the Sudzers, the Draft Board, and the Mad Zymurgists.